It's Cait and Bud's wedding, but the rain won't stop, the supposedly romantic Welsh castle feels creepy, and there's a dead body on the stairs. What appears to have been the accidental death of the wedding's choirmaster reveals itself to have been a murder. 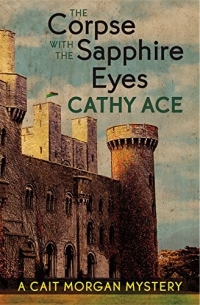 And when a series of mysterious events occur around the castle, Cait, Bud, and Cait's sister Sian tackle the case of The Corpse with the Sapphire Eyes, attempting to solve the mystery before another sinister event can ruin their nuptials.